the two concepts of a hollow deck, that I see is one built on the teleporter technology creating temporary matter to interact with. 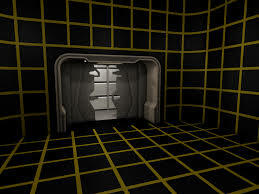 Or a virtual reality good enough to fool you into an immersive experience.If by the 23rd century we figure out artificial gravity it doesn’t seem that far of a stretch to use a force beam or force field to have a the body feel a projected table. And different levels to feel different textures. And the ability to control forced perspective to make it appear that two participants were farther apart than the interior dimensions of the room. This second version seems very possible or more possible. If technology follows its present arc.